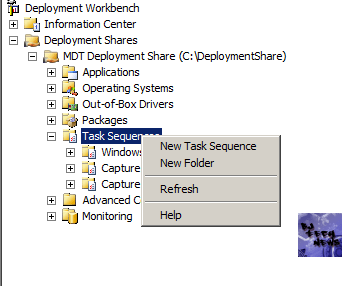 I was asked if there was another way to do the sysprep and capture process within MDT 2012. I said to myself, Heck! Yeah! There are several ways to do this, so this blog is a part II of Episode 12 on my BJTechNews Channel. While you could use MDT 2012 to install all the software needed, or even group policy, imagine the time this would take and therefore the amount of time that PC would be sitting there installing software rather than using it :). The simple way around this is to create a reference image of a PC and then capture an image of it to install onto all your other computers [lazy; but it works :)]. 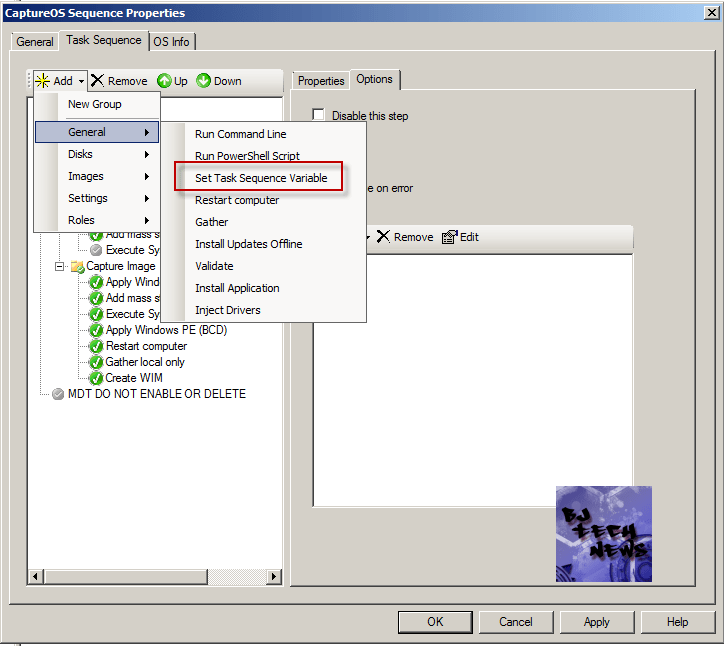 With MDT 2012 this is a very simple task and here’s how to do it. If you have to change this rule then you need to update the deployment share. Once the update has completed then you will need to replace your current boot images in Windows Deployment Services with the newly regenerate *.wim file. 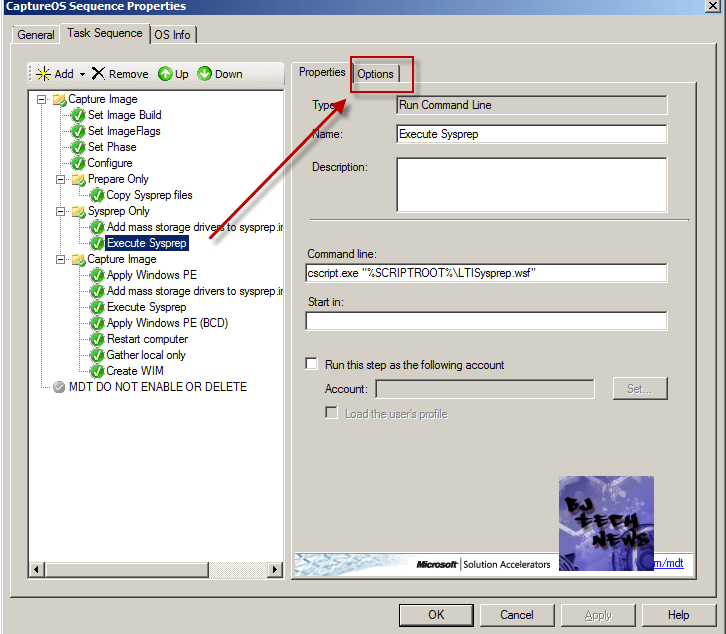 In my experience the execution of the sysprep command from the task sequence is patchy, so to get around this issue you can follow these steps to disable the sysprep command in the task sequence and run it manually before capturing the image of the reference computer. 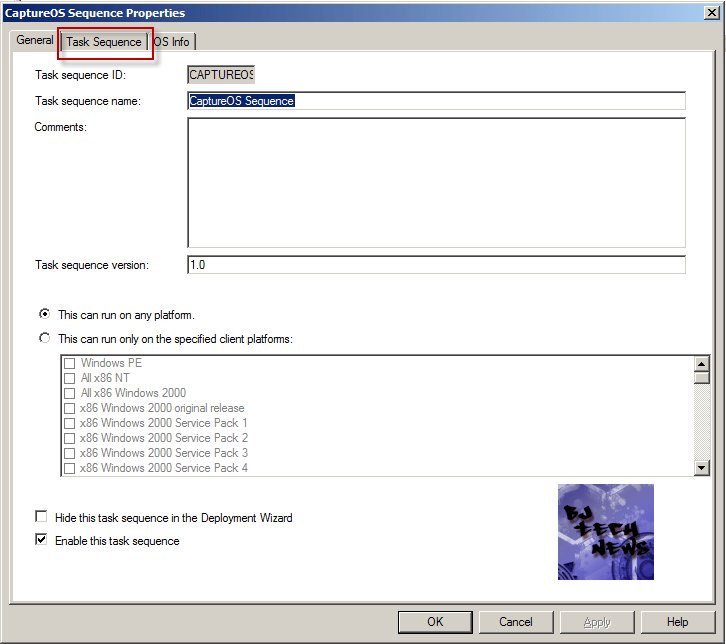 Click on the Execute Sysprep option and then click on the Option tab on the right hand side. I had some time to do a live event on this topic. The video below is a little long, but worth the watch due to it covering all the basics of capturing and sysprep in MDT 2012.
if you enjoyed the blog. please take the time to +1 it , comment or rate it below. Here is my scenario. 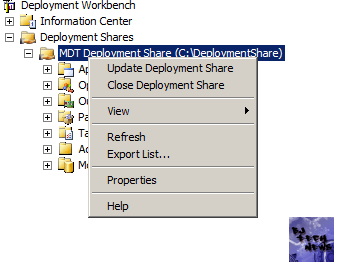 I deployed an image from MDT 2013 and updated it on a laptop. Now I want to sysprep and capture it. When I do it, I receive an error that it can’t find the sysprep file. Any ideas? 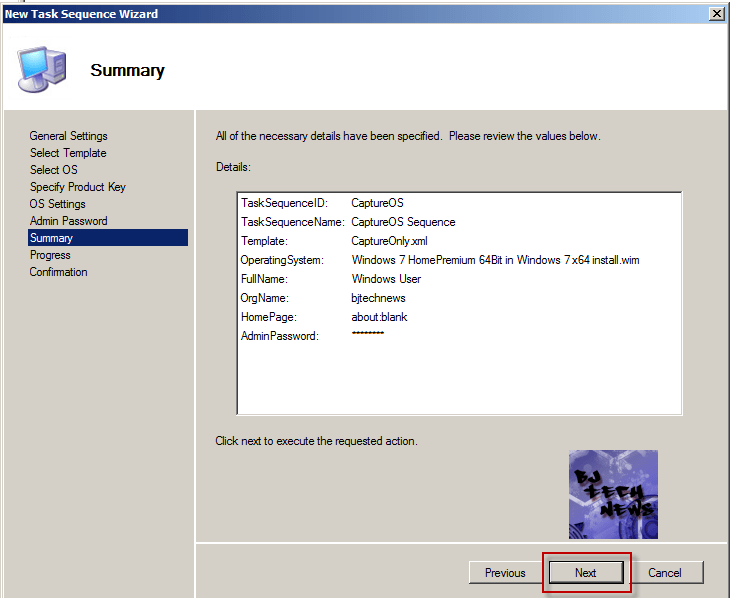 You’re getting error during the MDT sysprep and capture task sequence run time? After watching your livestream video, I was able to get an image captured. Thank you for the detailed walk through. I put the system into audit mode and made all of my customization and updates. This included setting a desktop background and certain shortcuts I need to be there in the image. This all went away during the sysprep process. Is there a way to include these in my image? If this has already been answered please point me in the direction of the answer. Thank you. Can you explain the purpose of sysprepping a machine during the Capture? Before I used MDT and had another program to get to PXE, the capture was never sysprepped, only the deploy. Why do it at both ends? okay, lol that makes sense. I think the second sysprep is a mistake on Microsoft part. I believe I create another video disabling both sysprep and manually it for a custom image. I wish i could see actual work you doing instead of your camera. You don’t go through talking every step as you doing on the screen. You do have a knowledge, but it’s hard to follow on the small screen you displaying. You can make camera picture smaller. Little over talk, but that’s ok. When try to capture the Custom Image of Windows XP for MDT 2012 Update 1 getting the below error. My issue is…working with an actual machine, not a virtual machine. The Dell Latitude 10 ST2 does NOT have PXE ability so I’m using MDT. The issue is that it fails using Sysprep and Capture, stating that its failing on the User Restore section. I don’t even want to do any USMT stuff right now. I don’t get why my Capture is trying to gather or restore user files. I just want to capture the thick image as is. Any ideas? 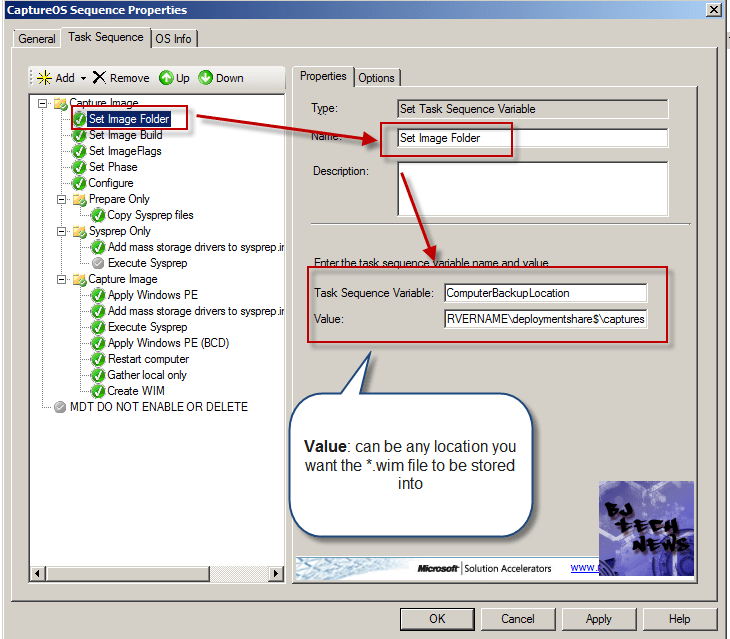 I finally manged to fully capture a image and deploy it using MDT 2012, with new applications, drivers etc. It’s danish language 🙂 (In english it says: activation period has expired). How do I prevent this? – There is no problem when I say Activate Now. I have put a script in my task sequence later on, that automatically activates windows). On our previous image, in my company, there are no problems – And I use the exact same windows key. The first few deployments i made, it didnt appear. I suspect that it something to do when I captured the image and I changed the Rearm settings (It wasnt possible to sys prep the image, if I didn’t do it). Have this error ever occured to you? what type of serial key are you using? KMS? MAK? to license your Windows 7 machines? I’m MAK activation through Windows Intune. Maybe I need to look at bit more into the VAMT. It is just weird that after i made this new image, the error occurs. you sir are a genious!!!!! thank you soo much i have been struggling with this issue and seems to be working now. Thanks a lot, i will go ahead and like the video. Hi there sorry for the late post. i am having an issue with capturing a reference image. 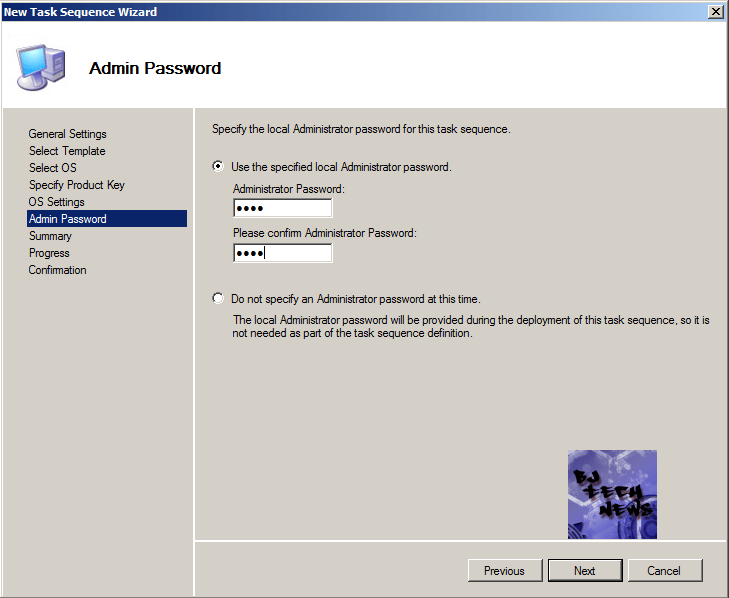 I have done the sysprep manually and created the same task sequence where i disable sysprep. I have followed these same instructions before and it worked a couple 6 months ago i think. The computer does sysprep but when i try to capture it with my mdt2012 it gives me the following error. Failed to run the action: apply Windows PE. The execution of the group (Capture Image) has failed and the execution has been aborted. An action faied. I have close to 100gb of free space on the drive so i know its not a space issue. Can you advise on what i can do? I have also tried to do a sysprep and capture task sequence before but as it is sysprepping it will end all network connections and loose connection to my mdt. Thanks for your response i will try this tomorrow and see if works. i had originally syspreped the machine and try to run the capture and that is how i got the 8 errors while capturing. i will give this a try and thanks for your videos they are very helpful. Just a follow up to previous post…. 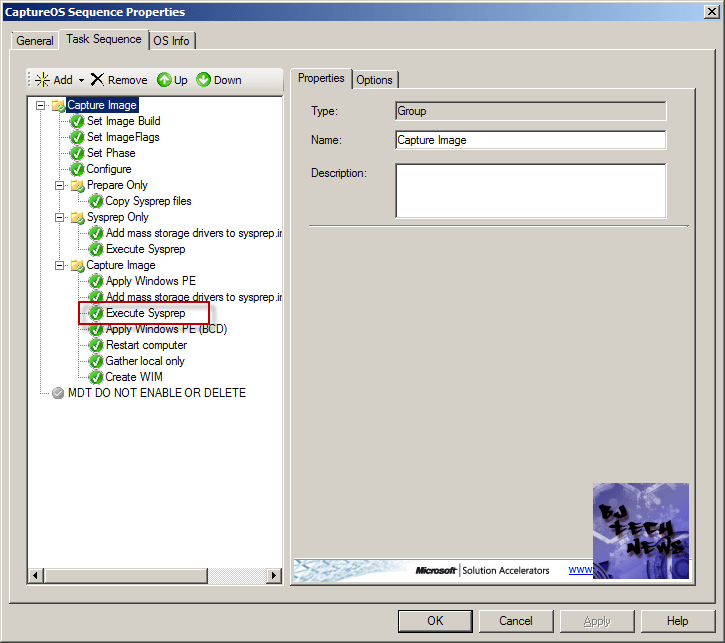 My traditional capture TS using sysprep did indeed work.. the problem was with deploying the image via TS. The problem had to do with Internet Explorer 10 being installed in the image. There is a setting in the unattend file for a welcome message located in the Specialize phase. if you disable that setting, the image will install correctly. good to know. i will add that to the records. by the way, doing a livestream event this Sunday on this topic. please share and stop by to support. it’s at 12pm EST. Thank you very much for this nice guide. It is very helpful. I’m new to MDT 2012 and other windows deployment stuff and therefore ran into some problems. I have followed your guide in every way, but somehow the capture task sequence dosnt do anything. It dosnt come with any erorrs or warning, it just dosnt capture anyhing? Do you have any clue what i am doing wrong? Well, I have many people that are having issues with the capture part of MDT. I am doing a Google+ Hangout event of me setting up the MDT and capturing a Windows 7 machine. A very basic capture. what’s your customsetting.ini look like? 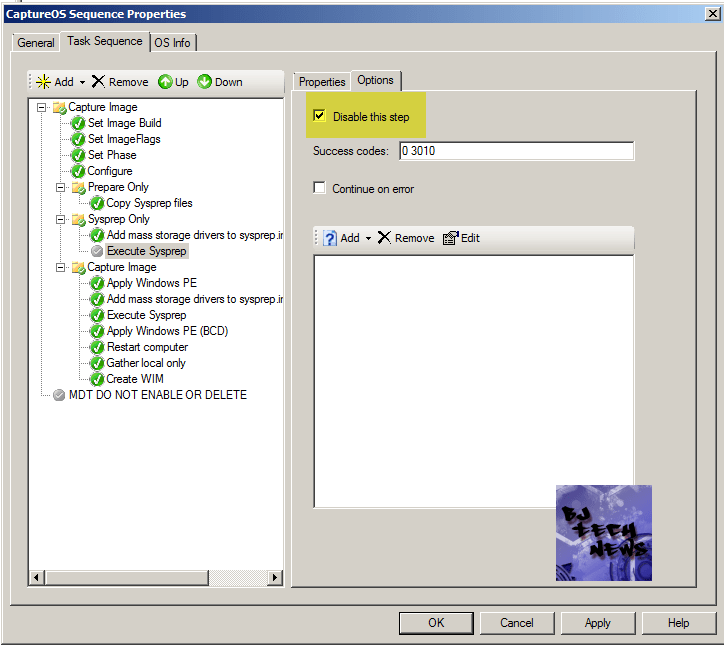 These settings are for automating the process when setting a new image up (My company already got a image running, i just need to update it and therefore needs to capture a new image). Do I need to changes the custom.ini file, when im doing a sysprep & capture? Its the google hangout event available anywhere? Unfortunately i wasnt able to there. okay did you declare a location for your capture OS? also I did a livestream event dealing with common issues with sysprep and capture within MDT 2012 and show everyone how I normally do. did everything live with a working capture and deployment of the capture image. it’s pretty long, but worth the viewing. check it out and if you still have more question we could do a google+ hanghout. here is the video link goo.gl/O9H7KC. Got it resolved. The problem was due to a capture that did not properly execute sysprep before capturing the image. Sysprep did not run because a modification had occured in a core LiteTouch script in order to work pass a Clone-Tag issue in Windows 8. I commented a line out back in April and had completely forgotten about it. Bad bad idea. Ultimatiely after I redeployed my virtual from VM, sysprepped and recaptured, deployment went the smoothest it ever has…except for an unattend.xml error due to IE10 Welcome startup. Sheesh…what a weekend, now back at work. CHEEERs. Good to hear you resolved the issue. Well I’m planning on doing a live stream on this topic during Labor Day weekend. Thinking about doing it this Saturday. I have been fighting this same issue for a week. I swear every time I install MDT I run into a new issue. I have 2 servers running right now, that are configured identically. The first server, which is going away, captures ok using your method. Prior to 2012 I never had an issue using the capture TS. My new server running the same version, runs into the disk space issue, with winPE trying to run on the system reserved partition. If I try to run the capture TS, it again captures the image and fails during the install of the image in an unrecoverable installation state. This is becoming increasingly frustrating. I’m using a hyperV VM vanilla install of windows 7x64sp1. unreal, made the policy changes and recaptured the image, redeployed, still didn’t auto-login. I still think the issue has to do with the 100mb partition being assigned a drive letter in PE. This is why I couldn’t capture using the manual sysprep method. When looking at my SMSTS.LOG it shows “D:\_SMSTaskSequence does not exist”, that’s because in Windows it’s C:\SMSTaskSequence… I’ve been messing with this for weeks now, and it’s crazy frustrating to think I know what’s going on but not know how to fix it!! Another way i did this was to run drive grabber on the reference computer, then import the drives into MDT and then i could deploy windows 7 directly to the other reference machines, as and when i needed to much quicker than running sysprep, i can deploy windows 7 sp1 direct complete with all drivers and directly onto the domain. Drive grabber? Never heard of it. Need to check that out. I’m planning on doing a live stream on this topic. Getting my vms really for the event. Yeah nice little tool, run it and it grabs all the drivers on a reference machine then as I mentioned just import and then pie boot when I need to, if i have an xp machine that I need to upgrade to 7 I do the upgrade with a windows 7 DVD or USB whichever i have then make sure imhave all the correct drivers either by windows update or the manufacturers website, the once again I run drive grabber and import and then I can rebuild it anytime I want to, for instance a virus or a replaced hard drive. Try it and its so much easier than sys prep. I added clonetag and executed the task sequence and it has now rebooted into PE to capture. I don’t know if it was clonetag or not because I realized that this machine was running on a workgroup, but trying to execute deploy.bat off the domain. No big deal because I was editing my domain credentials to access the server but I realized I was inadvertently running deploy.bat as administrator, which would have used the local computers account for execution. No idea if that would cause issues or not. I guess I never thought much about it until now but I assumed that it would be best to capture a machine OFF of the domain so it wasn’t pulling over unecessary domain accounts…my own on every image. Makes me wonder if something like a Capture USB key would be useful to get around this portential issue. very interesting. never heard of “clongtag” before. I would like to see how you set that up. I planning on doing a live stream on this during labor weekend. stay tune for the invite. So I did as mentioned inserting the Clonetag reg setting into the task sequence and it would finally capture without error. Unfortunatly later when I would try and deploy this captured image it would never reach the end of it’s deployment process. It would install the custom image but never complete the task sequence leaving residual files on the system….I’ll add clonetag to this sequence and deploy, maybe somethings different than it was a couple months ago..
let me know. 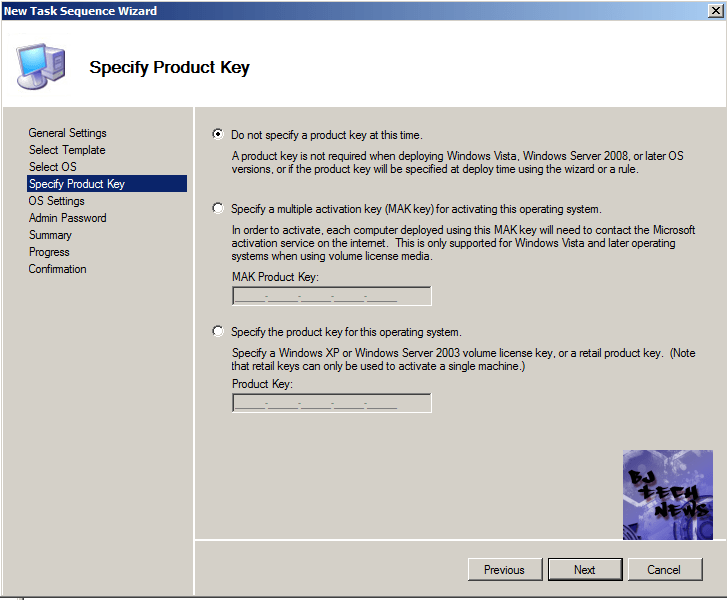 many people are always having issue with the sysprep and capture of MDT. I’ll probably might have to do another fresh video on this and post it up in the channel. yep that def didn’t work, as soono as I exec sysprep manually in windows I lost my network connection so couldn’t browse to the deployment share. That’s what I used to do but we just stripped out the sysprep function in the tut lol. I think I see what you’re saying though, I’ll exec sysprepe manually then try navigating to the deploymentshare in windows and exec the task sequence. trying enabling sysprep on the TS, but manually run the deployment within your machine. 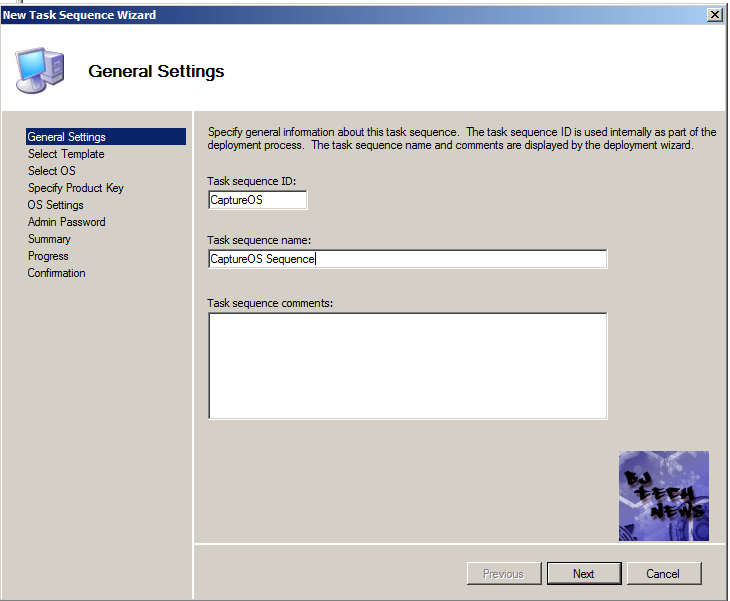 log into your custom machine and run the task sequence manually within the machine. it will sysprep it and capture it. 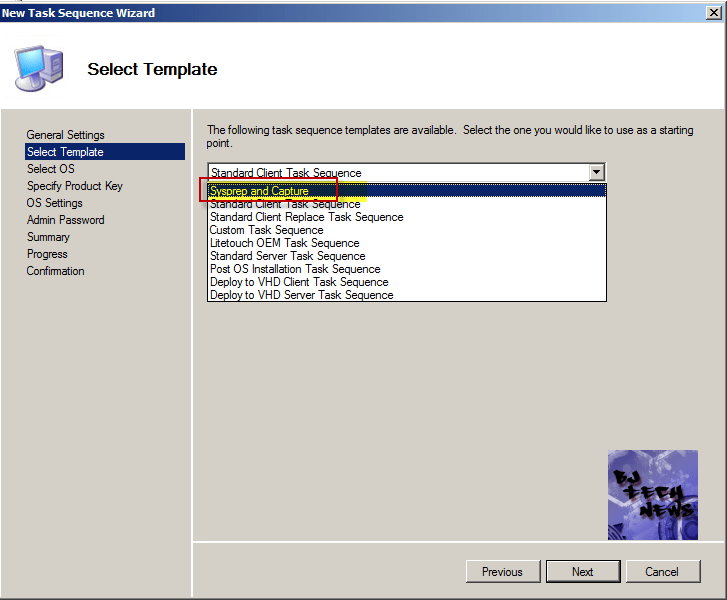 you want to use your capture *.wim file and deploy it using WDS? Now I can deploy my reference image. Nice write-up, thanks. One question though, when disabling sysprep, your first screen capture shows you selecting ‘Execute sysprep’ under ‘Capture Image,’ and then in your next screen capture you actually disable the one under ‘Sysprep only.’ I understand that was probably a mistake, but just wondering which one to actually disable. Thanks! good eye. in the end i actually disabled both sysprep because i decided to run it manually and have an unattended file to run off.